Lucy Cooke celebrates the otherwise underappreciated sloth in her book a little book of SLOTH. Few children’s books begin with an author’s note confessing “I love sloths. I always have.” Of course, to my knowledge, there are just not many books entirely dedicated to the beloved sloth and shame on publishing for that. 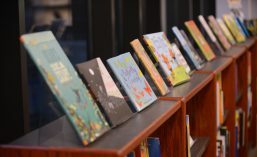 Books about soft, fuzzy kittens and playful puppies enjoy rampant popularity. To be sure, if mice were paid for their abundance of stories they would have started their own colony on the moon (after all it is made of cheese, right?) far from those mean kittens. Who knows why authors love them so. No offense against rodents but even I jump when one scampers across the living room floor. The world’s largest rodent, the capybara, happens to be my favorite but how many books were published about the capybara last year (seriously, if there were any, let me know)? My apologies…this is neither about my empathy for the under-sloth as it were nor my anxiety from excessive dog/cat/mouse lit. Slothville shelters well over a hundred sloths that have been hurt or found parentless in the wild. Founded by Judy Arroyo in Costa Rica, the sanctuary cares for the curious, grinning creatures which are lanky in appearance and leisurely in motion. 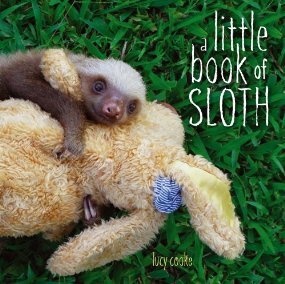 In reference to a sloth named Mateo who is particularly protective of his stuffed cow Moo, Cooke jests, “If any of the other baby sloths tries to sneak a Moo hug, a fight breaks out – a very, very slow fight, in which the winner is the last sloth to stay awake.” Each page of the colorful photo album contains a single image or multiple images of the animals in cute poses a la Anne Geddes, hanging from tree limbs, or snuggling with stuffed toys, blankets, and fellow sloths. Alongside images the author relays interesting tidbits with clever quips on the animal’s behavior. The sloth’s unique behavior and bizarre characteristics will fascinate parents and children alike while the round eyed, stumpy nosed babies in their hand-crafted onesies are absolutely adorable. Besides, with a little imagination they sort of look like mice, too. Envision a rainy evening, scoop up your little one, and snuggle up to a little book of SLOTH.